It was originally recorded in 2012 by an Idols South Africa finalist and season 7 runner-up Mark Haze, appearing on his debut album Where Angels Fear to Fly in 2012 It was produced by Theo Crous and released on Universal Music South Africa. although his recording of the song was never released in the United States. 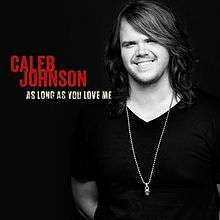 Original American Idol winner, Kelly Clarkson also wanted the song, but was not able to record it in time and the license was granted to Caleb Johnson who laid down the track as his own winning song. Back in 2012, Hawkins told Yahoo Music, "I think she liked it," "Kelly Clarkson had a song [of mine] on hold, but unfortunately, within the lyrics, it talks about my mustache. So it needs a slight rewrite. She liked the tune, but I'm not sure if she was really feeling the subject matter." "The song was considered by Kelly, but ultimately 'unexploited', as we say in songwriting world." The song debuted at No. 41 on the Hot Rock Songs chart and No. 26 on the Rock Digital Songs chart. The song sold 10,000 copies in the US in its debut week. ↑ Liberman, Mark. "Caleb Johnson's debut album has a title: 'Testify'". USA Today. Retrieved June 23, 2014. ↑ Bothners.co.za: Mark Haze News Archived May 22, 2014, at the Wayback Machine. ↑ Mark haze website: Where Angels Fear to Fly Archived February 26, 2014, at the Wayback Machine. ↑ Parker, Lyndsey (May 20, 2014). "As Long As You Love Me" Originally Pitched to Kelly Clarkson". Rolling Stone. Retrieved May 23, 2014.